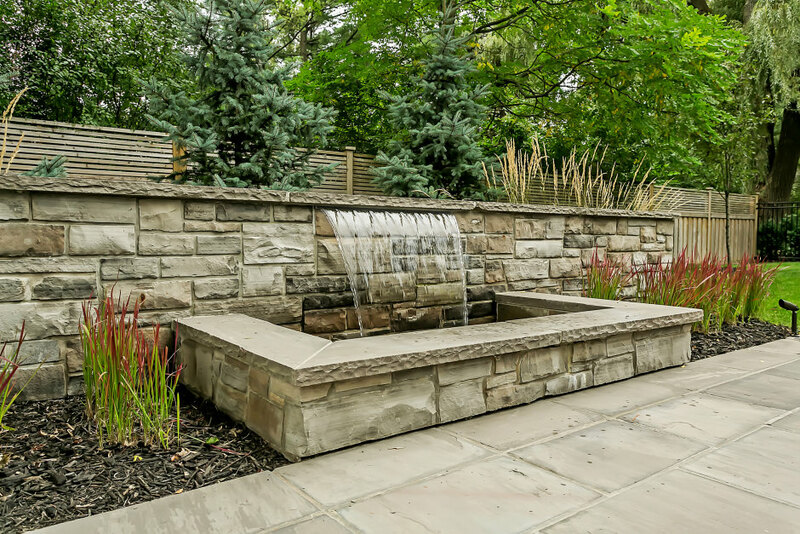 Tradition meets modernity in this exquisite Gren Weis designed custom home, located in one of South East Oakville’s most sought after pockets. 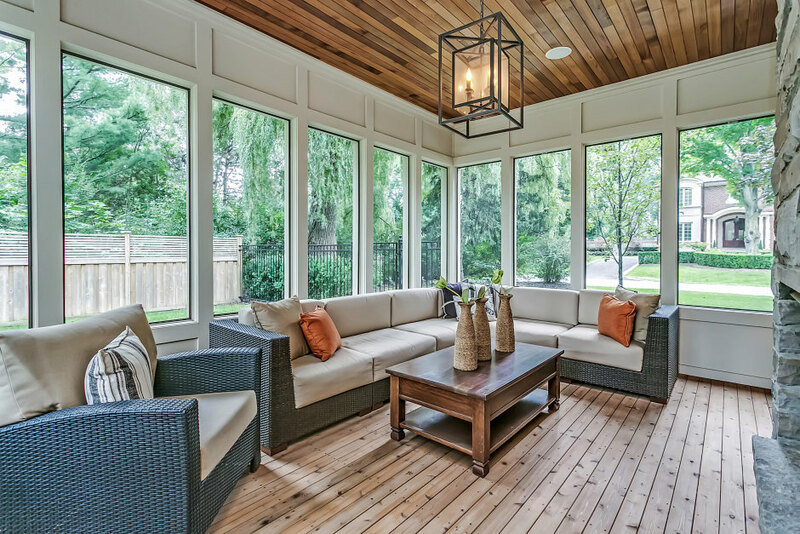 Classic components, from the covered front porch to the shingled exterior, are juxtaposed with contemporary elements, such as the loft-style Kolbe windows, which flood the home with natural light. Enter the foyer, onto a natural stone tile landing with stone mosaic accent inset in custom stained 5” quarter-sawn wide plank oak hardwood flooring. An office with bay window is quietly tucked away through double French doors. The open concept formal sitting and dining room with double chandeliers is surrounded by multiple exposure full-height casement windows with upgraded hardware. 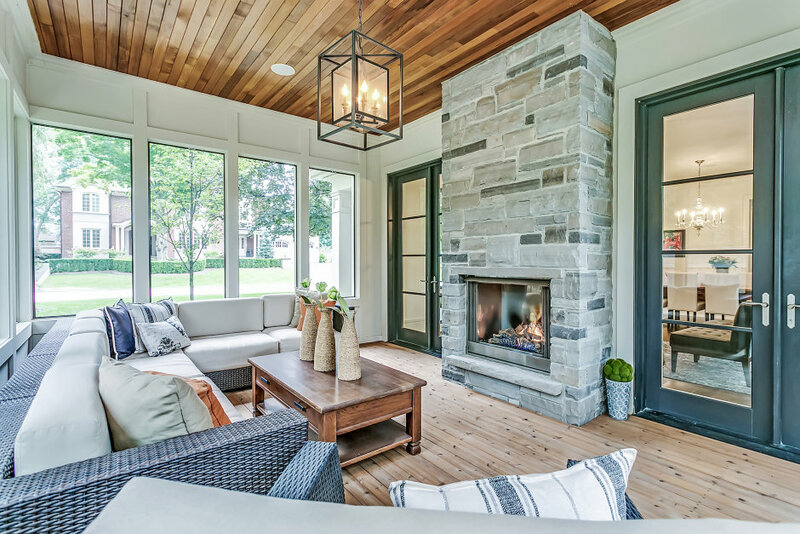 An open flame gas fireplace with honed granite and full-height stone surround is flanked by double French doors leading to a screened in outdoor living room, with open flame stainless steel gas fireplace, exposed cedar ceiling, and central chandelier. Built-in speakers throughout the home provide multiple spaces for entertaining year-round. The piece-de-resistance of the home is decidedly the open concept great room and gourmet eat-in kitchen. Panoramic full-height windows provide an indoor-outdoor feel. Custom bookmatched Walnut soft-close cabinetry with unique stainless steel and glass accent cabinets marry sleekness with warmth. Ultimate high-end appliances are throughout, from the commercial grade Wolf six-burner gas stove with double ovens, to the built-in Sub-Zero refrigerator with double freezer drawers and additional built-in temperature controlled Sub-Zero wine fridge. Honed 3” granite countertops compliment a marble subway tile backsplash, while the 12’ central island boasts Caesarstone countertops and ample bar seating. A separate breakfast area is centered beneath a custom installation of 20 individual BOCCI lights imported from Vancouver. A servery is smartly located between the kitchen and the access to the rear covered terrace. A functional secondary foyer provides easy access to both an elegant powder room with heated natural stone flooring, and the finished 2.5 car garage. An Oak staircase with tempered glass panel and stainless steel railing leads to the second level landing, flooded with natural light by a skylight with triple frosted glass panels. 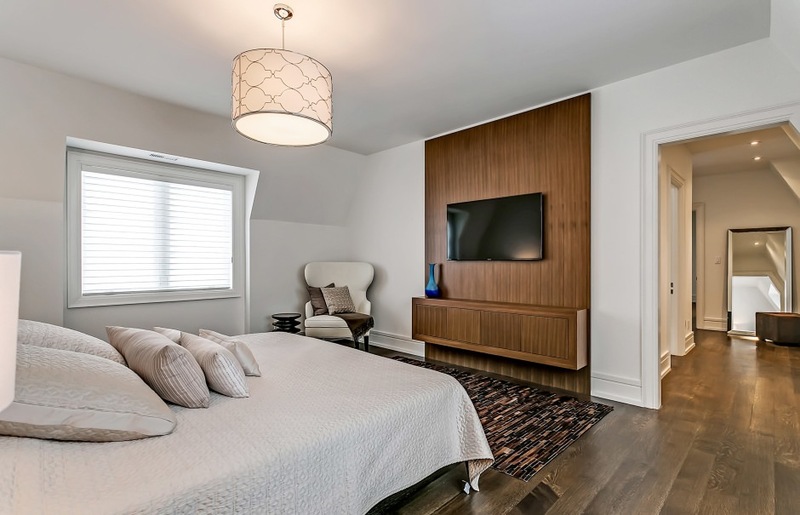 The master bedroom features a built-in Walnut entertainment panel with floating cabinetry, and an open-air walk-in closet with custom cabinets. 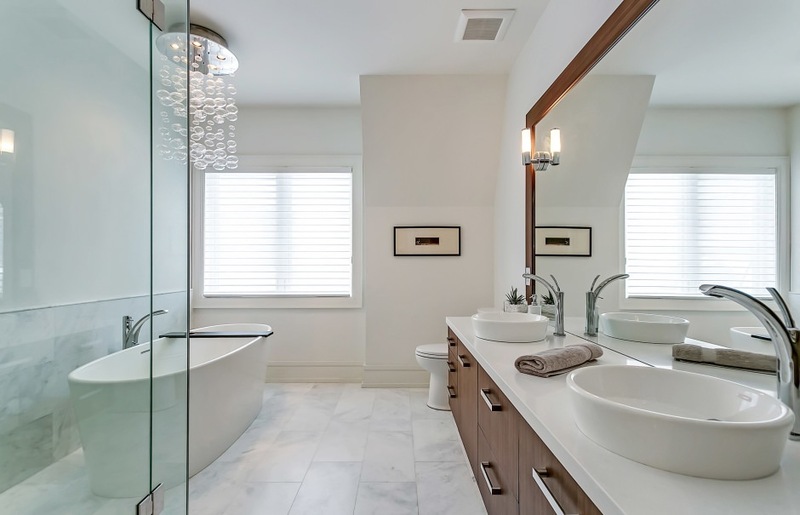 The spa-like five-piece ensuite boasts heated marble flooring and a floating Walnut vanity with Caesarstone countertop and His & Her vessel sinks. A chandelier suspends above the standalone WetStyle soaker tub, while an additional walk-in glass shower is dressed with stone mosaic tile flooring, marble tile surround, and hand-held and rain shower heads. 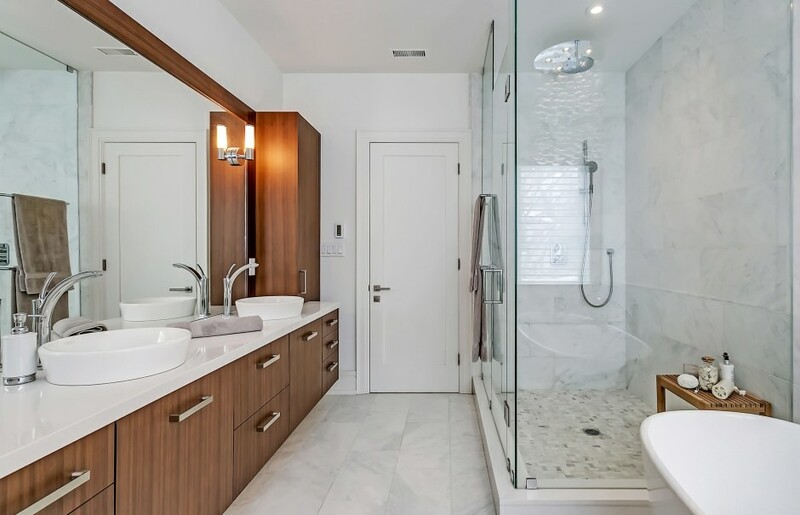 The main four-piece bathroom is equally lavish, servicing two additional bedrooms, while a fourth bedroom includes it’s own three-piece ensuite. 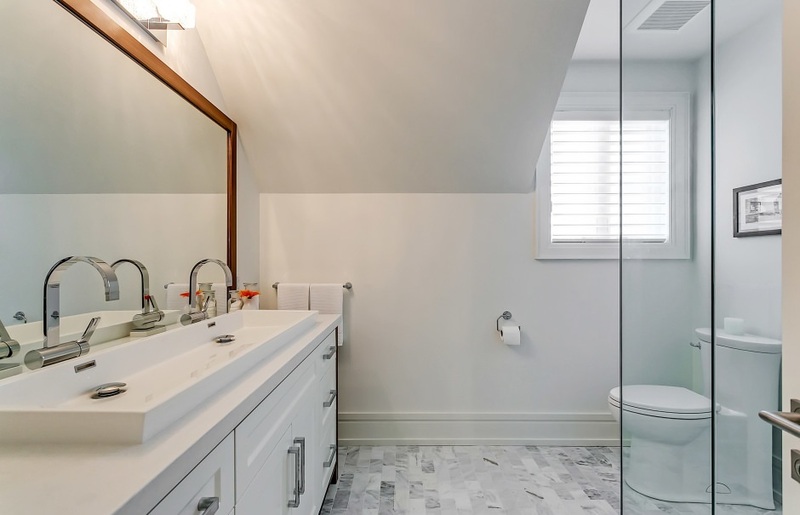 A convenient second level laundry room is beautifully designed, with attractive custom-sprayed soft-close cabinetry, Caesarstone folding counter, and a high-gloss glass mosaic tile backsplash. 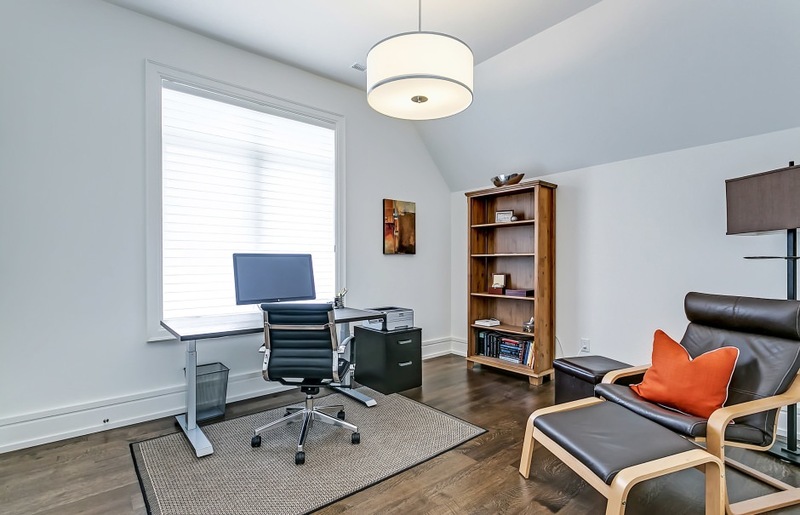 A hidden bonus room provides additional living space, for hobbies and/or a children’s playroom. 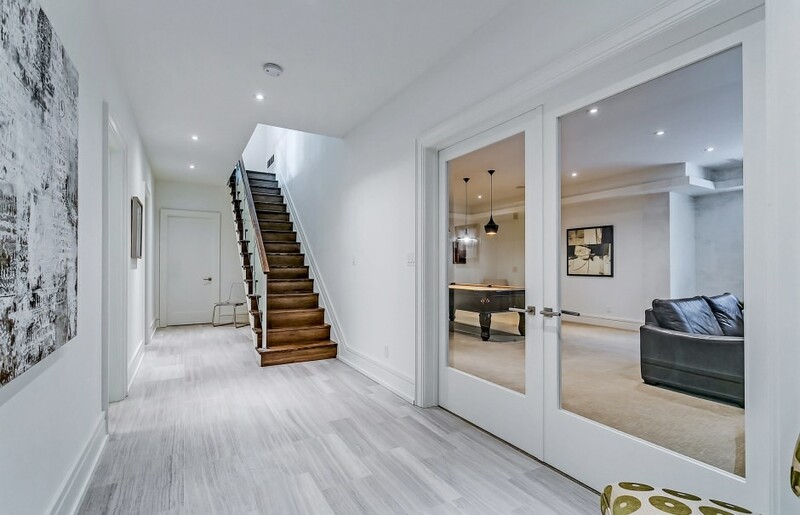 The fully finished lower level is accessible by a wide Oak staircase allowing for a feeling of connectedness with the rest of the home. 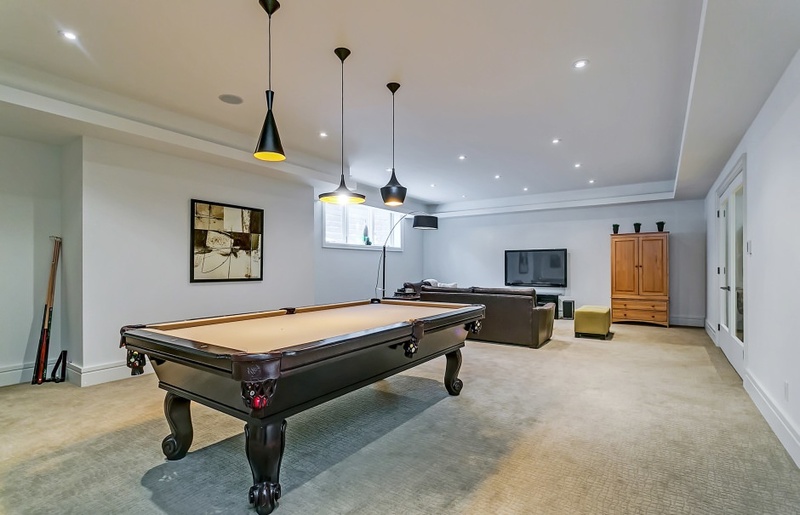 An expansive recreation and games room with oversized window opens to a glassed-in exercise room with mirrored wall, with built-in surround sound ceiling speakers and mini halogen pot lighting throughout. 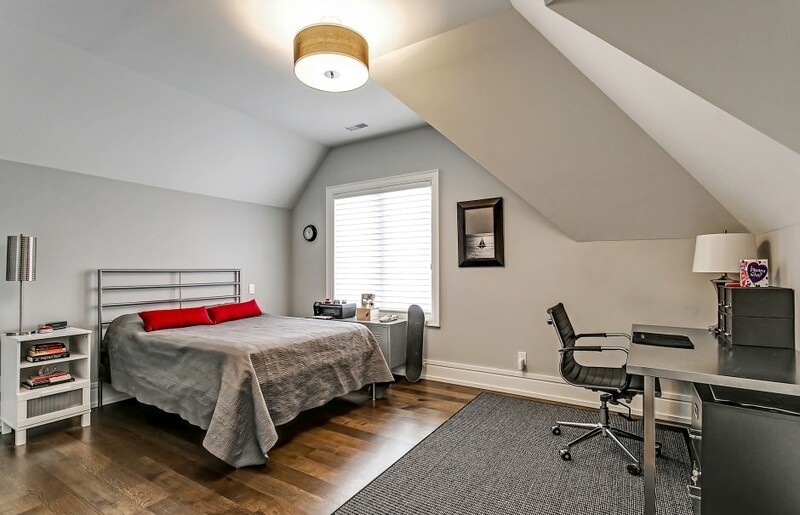 A fifth bedroom and full bathroom with ensuite access is an ideal nanny suite or “teen haven”. The fully fenced rear yard, with professional landscaping, backs onto Lawson Park with views of the charming historic bank barn. A covered flagstone terrace with built-in ceiling speakers, and additional open-air patio with linear stone waterfall feature provide ample space for al-fresco dining with family and friends. Unparalleled value for an outstanding home in an unbeatable location.